The idea for this antipasto came from ChgoJohn from the Bartolini kitchens. It was served to him in a restaurant in Florence, and he blogged about it. 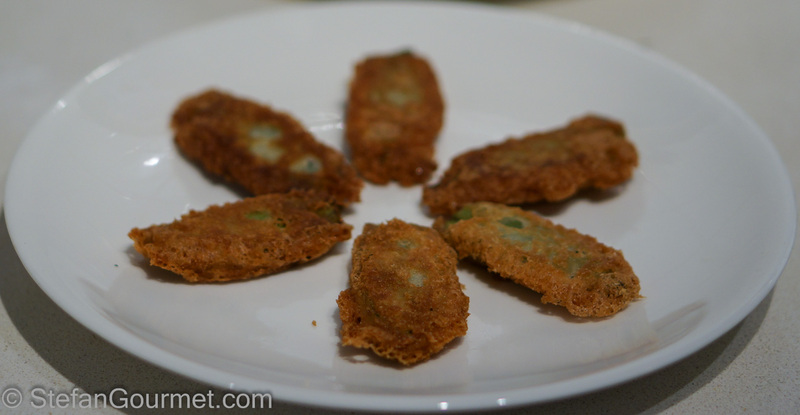 It is simply two sage leaves with anchovies in between, dipped in batter, and then fried. The result was better than I could have imagined! It has a great flavor and crispy texture, and is an antipasto I’ll most definitely make again! Thanks for sharing, John! 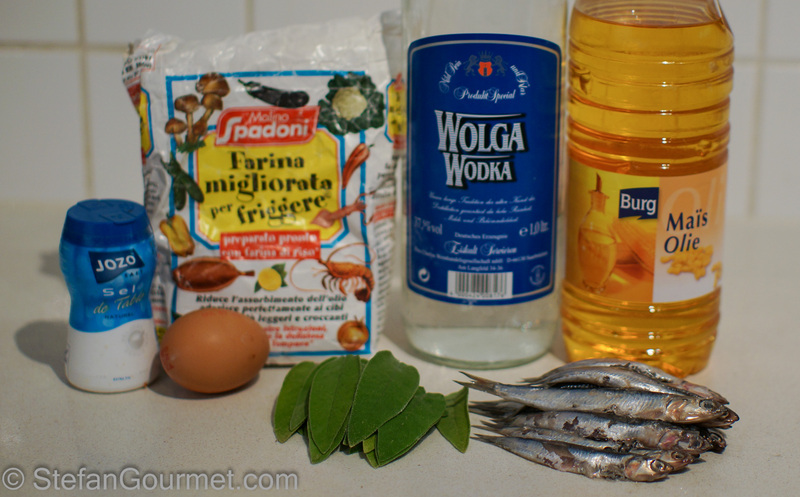 I am lucky enough to be able to purchase fresh anchovies, but you can also make this with canned or salted anchovies. Sage is a very easy herb to grow in your own herb garden. If it doesn’t freeze too much, you can keep the same plant for years and it will keep growing and provide a virtually endless supply of aromatic sage leaves. For an even crispier result I’ve used vodka in the batter, but you can also use cold water, preferably carbonated. Both the alcohol and the carbonated water will cause the batter to have more bubbles. Another trick for a lighter crispier texture is to use part rice flour or corn starch instead of regular flour. 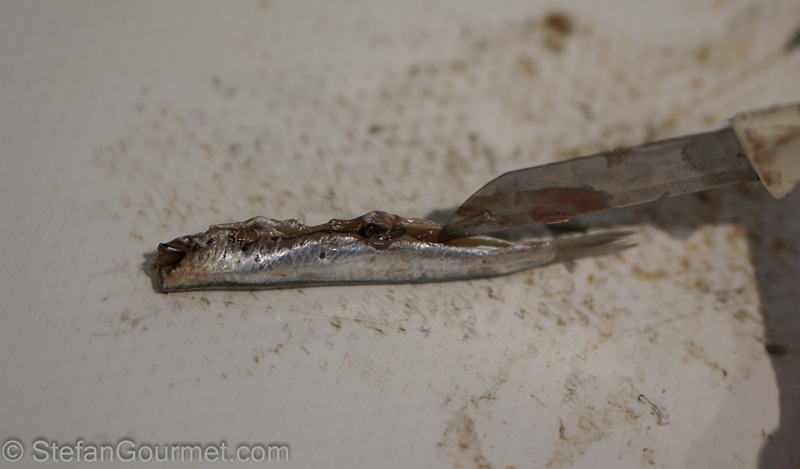 When using salted anchovies, soak them in water to remove some of the salt. When using canned anchovies, drain them and pat dry with paper towels. 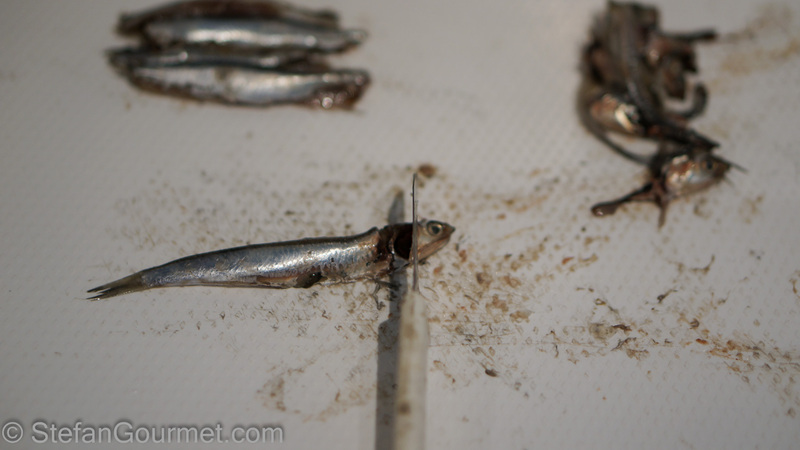 When using fresh anchovies, you’ll have to clean them. You can do this with a small knife or with your fingers. First, remove the head. Then, open up the belly. Finally, remove the spine and the intestine. Repeat until you have cleaned all the anchovies. Rinse them under cold running water and pat dry with paper towels. 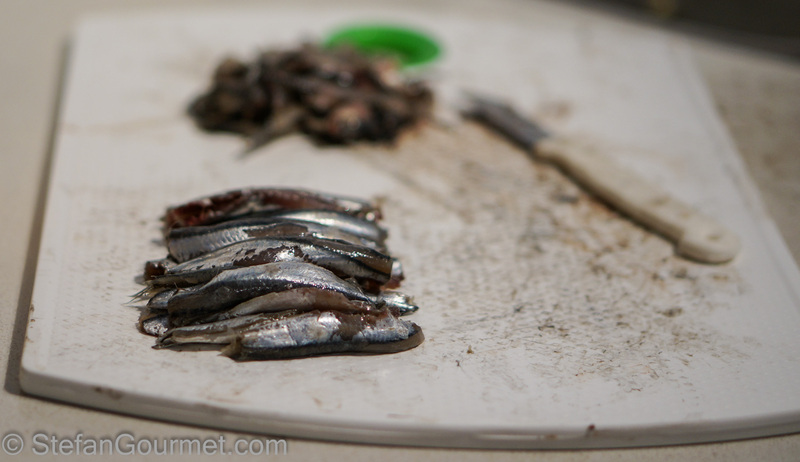 When using fresh anchovies, season them lightly with salt. Sort the sage leaves by length to make pairs that approximately have the same size. 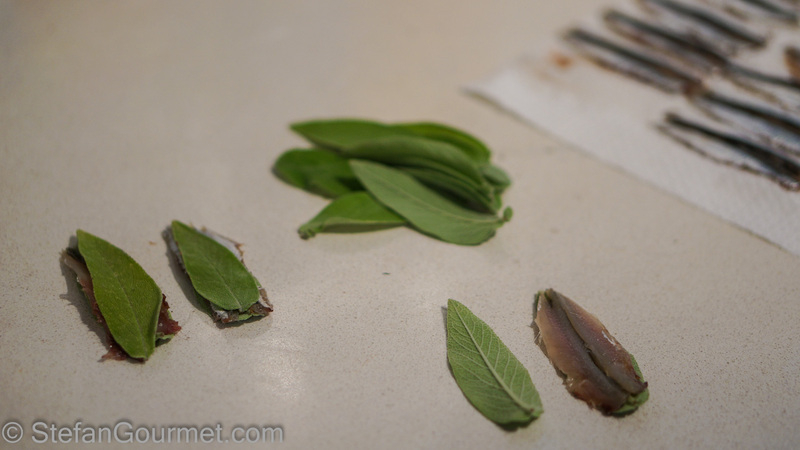 Put a double anchovies on a sage leaf, cover with the matching leaf, and press firmly with the palm of your hand. Repeat until you have stuffed all of the sage leaves with anchovies. 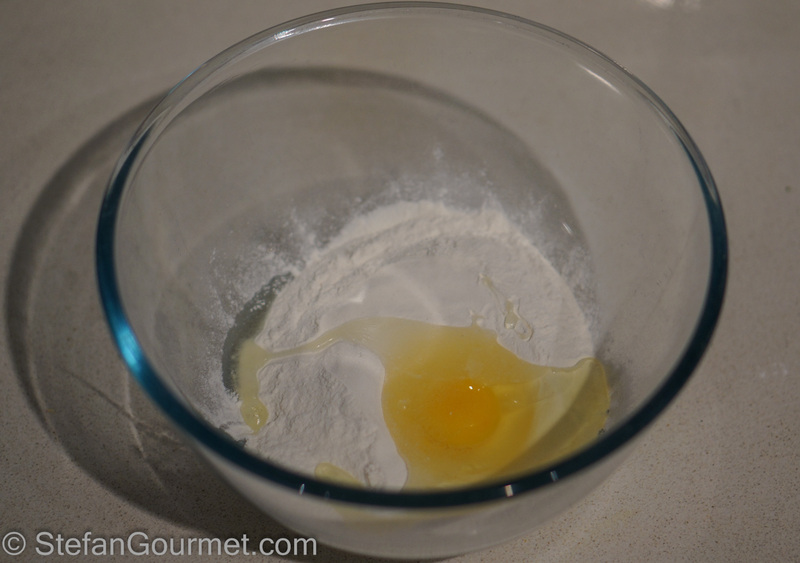 For the batter, combine the flour (or flour, rice flour, and baking powder) and the egg in a bowl. 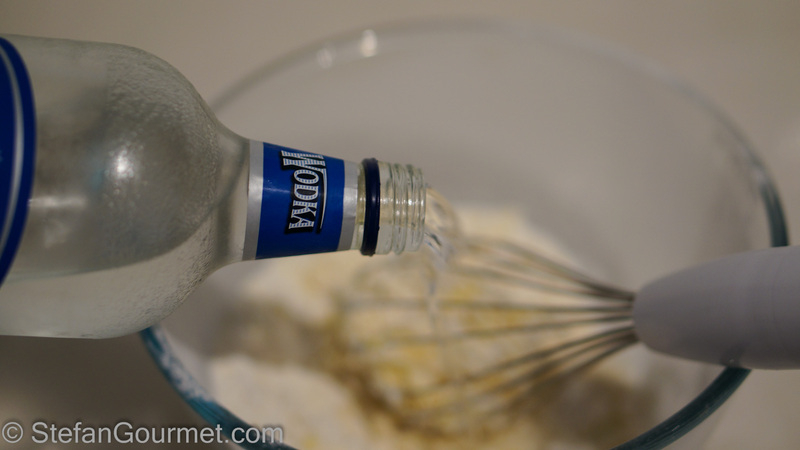 Beat to incorporate the egg and add vodka while beating. 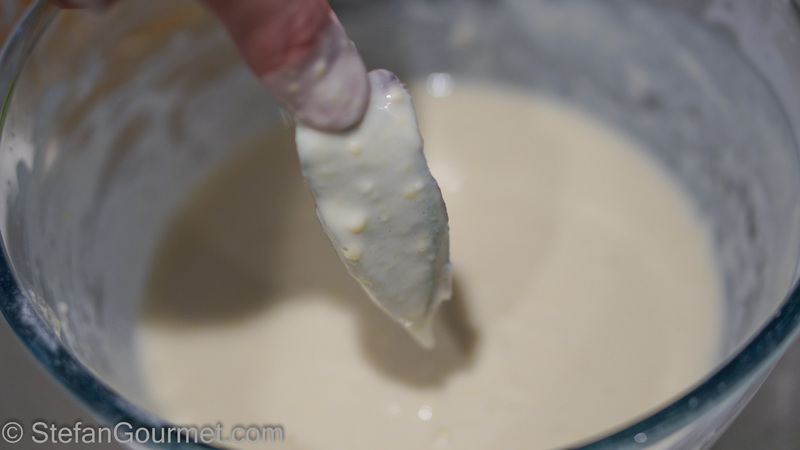 The batter should become like pancake batter, not too thick and not too thin. Heat about 5 mm (1/4 inch) of oil in a frying pan. 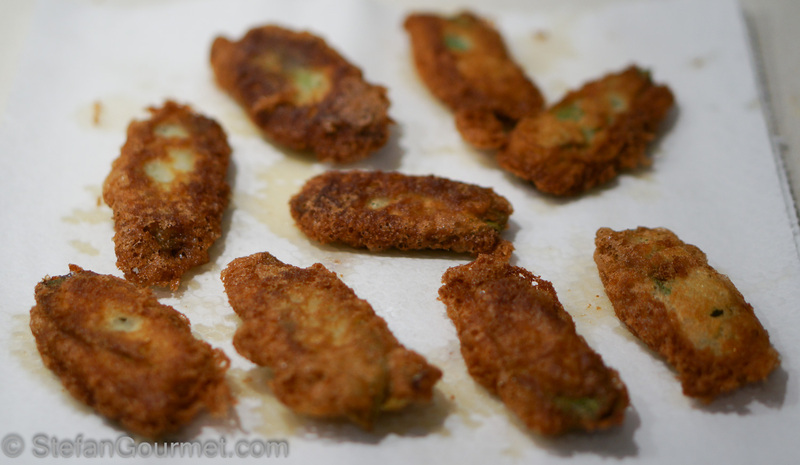 Dip a pair of sage leaves in the batter, shaking off any excess, and carefully lower it into the pan. Repeat until you have filled the pan without overcrowding it. 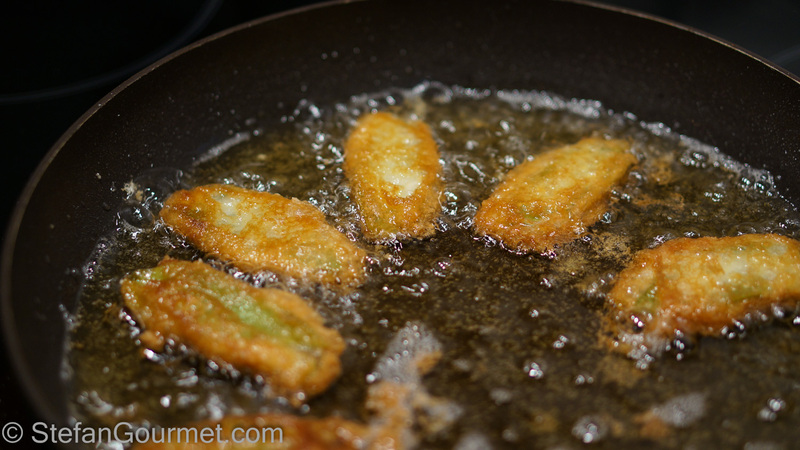 Turn them around once they are golden, and then continue to fry until they are golden on both sides. Some of mine were slightly too dark — they are best when they are golden brown. Allow the fried sage to drain on paper towels. 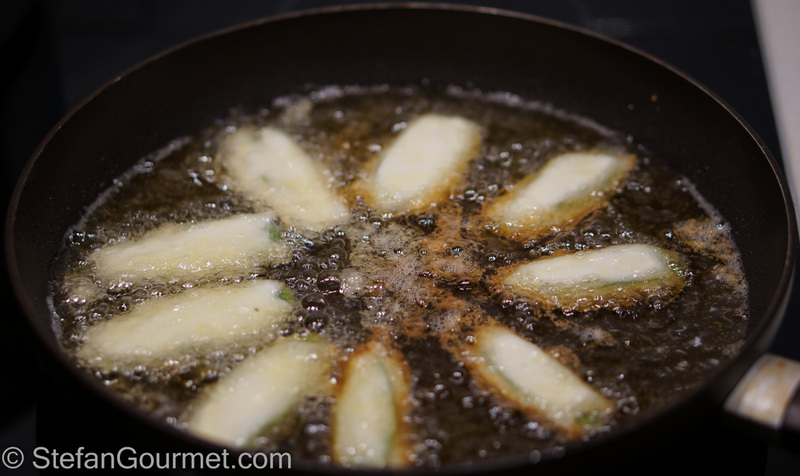 If you are frying a lot of them, keep them warm in the oven (at 100ºC/200ºF or so) while you fry the other batches. Serve at once with a lemon wedge. We enjoyed this with a nice glass of prosecco. An aromatic Italian dry white would also work. Two years ago I blogged about baking ‘real’ pizza in a home oven by using an aluminum pizza plate. I even dared to write about this in Italian, which resulted in some reactions from Italians who thought it was crazy that a Dutchman would tell them how to make pizza 😉 The trick actually works, although the oven we now have on our boat that can actually go up as high as 500ºC/900ºF works even better. nella mia regione (Friuli Venezia Giulia) si usa fare la salvia fritta con la pastella ed è buonissima ma la tua ricetta mi fa proprio gola, deve essere ottima, quindi non mi rimane altro che provarla,. Stefan, this looks incredible, but I need to ask you a question, and I don’t have your email address. I went to the store to buy salmon – I keep promising you that I will sous vide salmon, and they didn’t have any – but I bought a beautiful filet of sea bass. Can you give me a temperature and time for sous vide’ing sea bass? thanks so much!!! I just checked – you suggest 10-15 minutes at 118 degrees, followed by a sear. Any other comments? thanks again!!! Hi Mimi, if your fillet is very thick (more than half an inch) you may need to increase the time to 20 minutes. Other than that, I simply season the fish with salt and pepper, rub lightly with olive oil, cook sous-vide, and then sear in very hot clarified butter on the skin side only. Let me know how it turns out! Sea bass cooked this way will be very juicy and tender. P.S. You can message me on Facebook, and you can also find my e-mail address on Facebook. Oh thanks!!! I really appreciate the input. As already mentioned to John, never had them. They are haunting me! I’m leaving tomorrow for my country. Since I’m going north, I’ll try to find these beauties! So sorry, Stephen, for seemingly ignoring this post and your crediting my good fortune finding this recipe. This notification is one of the hundreds in my GMAIL spam folder, not to be confused with the hundreds in my WP spam folder. What a mess! Nevertheless, I am soo glad that you tried and enjoyed these tasty treats. What a concept! My traveling friends and I still rave about them whenever we’re together. 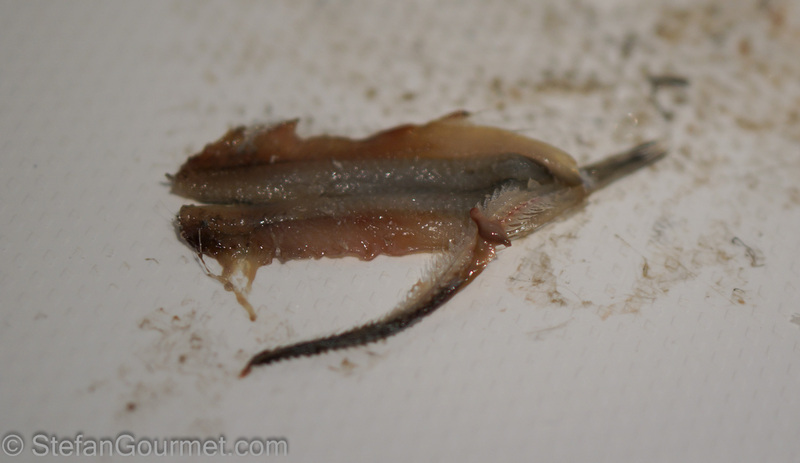 I envy your ability to get fresh anchovies. I bet yours are very close — probably better — to those we were served in Firenze. Good for you!